High Priest: How Many High Priests Are There in the Bible? Who's Best? HomeBlogSpiritualityHow Many High Priests Are Named in the Bible? What’s the difference between priest, chief priests, and high priest? From Mark 14:53 we see there are several chief priests but only one high priest. This is also confirmed in Matthew 26:3. With this as our basis, let’s explore each of these three roles: priests, chief priests, and high priest. Though many nations in the Bible have priests, for the Hebrew people, a priest is specifically a male descendent of Aaron from the tribe of Levi. This means there are a lot of priests. Using the NIV as a reference, the word priest occurs 864 times in the Bible. In the Bible the phrase chief priests seems to imply a special selection of priests, namely the leading ones. Chief priests (plural) occurs sixty-six times. However, chief priest (singular) occurs seventy-five times. While this may seem contradictory, it could be that the chief priest (singular) is a key leader who rises above the other chief priests, who are above the other priests. High priest (always singular, except for two times) is mentioned seventy-eight times in the Bible. We see reoccurring mentions in the Gospels: Matthew (seven times), Mark (eight), Luke (three), and John (ten). High priest also occurs in Acts (eleven times). However, the book leading the way with mentions of high priest is Hebrews (seventeen). Hilkiah, 2 Kings 22:4, 8, 23:4, 2 Chronicles 34:9. Eliashib, Nehemiah 3:1, 20, 13:28. Jozadak, Haggai 1:1,12, 12, 2:2, 4. Joshua, Zechariah 3:1, 8, 6:11. Caiaphas, Matthew 26:3, 26:57, John 11:49, 18:13, 24, Acts 4:6. Seraiah, 2 Kings 25:18, Jeremiah 52:24. Azariah, 2 Chronicles 26:20, 2 Chronicles 31:10. However, there is one more priest. He is the priest of all priests. What’s his name? His name is Jesus. The writer of the book of Hebrews talks at great length about Jesus being our high priest (Hebrews 2:17, 3:1, 4:14, 5:5, 6:20, 8:1). 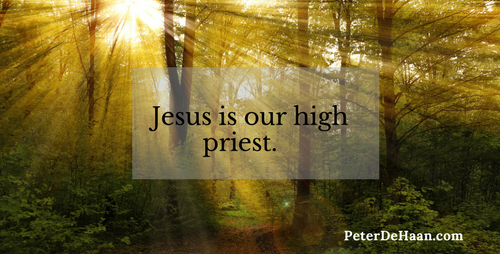 One way Jesus fulfills the Old Testament is by being our high priest. Ponder the implications. The Old Testament talks about priests to prepare us to embrace the ultimate priest, the highest of priests, Jesus. Jesus who became our once-for-all sacrifice to make us right with God and restore us back into relationship with him.